It’s hard to deny that the distinctiveness and success of titles like Dark Souls III and Bloodborne have consequentially birthed a new type of action role-playing game that could be very well be considered as a genre of its own, which has grown to be known as Souls-like. Several studios have already tried their hand at creating their own Souls-like game including Deck 13’s Lords of the Fallen, which was met with mixed reviews. The varied feedback didn’t deter the studio though as, a year later, The Surge was announced and was eventually revealed as the company’s next attempt at a Souls-like game. 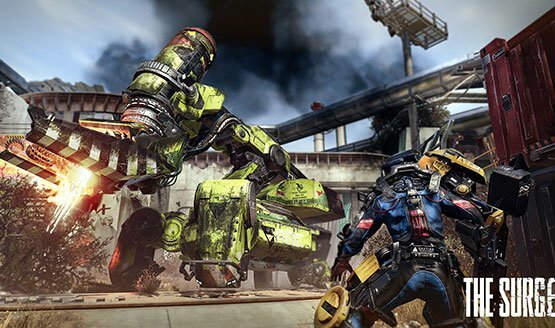 The Surge is set in an all-too-familiar dystopian future where humanity has depleted the Earth’s resources, destroyed the environment and the atmosphere, and suffers from both overpopulation and inevitably growing social tensions. A company called CREO has taken it upon themselves to help restore the world by launching rockets to repair the atmosphere and better humanity by developing technology such as the Exo Rig, the game’s version of exoskeletons. Players take on the role of a male paraplegic named Warren that has gone to work at CREO to get a new lease on life by getting himself augmented with an Exo Rig, which will allow him to walk again. Soon after the Exo Rig operation, the player wakes up to find themselves in CREO’s industrial complex and headquarters which has been torn apart by rogue machines and zombified Exo Rig-donning humans. The player must then try to fight and survive while trying to figure out just what has happened and, hopefully, escape. The Surge doesn’t focus or delve too much into its story and lore. Cutscenes are very few and far between and most of its story and lore is uncovered through meeting and conversing with fellow survivors and discovering audio logs that are scattered throughout the game’s many areas. In spite of this, The Surge is successfully able to establish an atmosphere of fear and build a world and identity of its own. 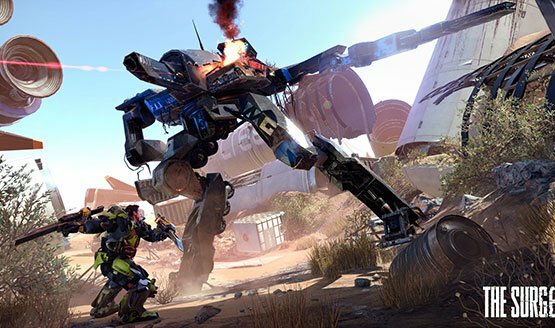 Like other Souls-like games, The Surge isn’t meant to be easy. There is no map to reference, no objective markers or the like to follow, and the game doesn’t constantly tell or remind you what you’re supposed to be doing. The game does help players out with several tutorials tips at the start of the game or when new mechanics are introduced, some of which are relayed using some ingeniously implemented in-game hints. Apart from the typical dialogue boxes or windows, some of the game’s tutorial messages and tips are displayed as floating messages attached to walls around the map. The game is divided into several main areas in the aforementioned industrial complex and the game’s level or map design is definitely one of its strengths. Instead of a mostly linear map, each of The Surge’s areas feature an intertwined map that oftentimes lead players to different shortcuts that allow them to easily backtrack to previously visited portions of the map, including the area’s Safe Room. Each area features a single Safe Room where players have access to a MedBay and crafting station. Discovering the aforementioned shortcuts make it easier for players to return to the area’s Safe Room but returning, to either heal, equip new implants or armor pieces, or do some crafting, has its own drawbacks as enemies are quick to respawn, forcing players to either run past or fight them again. The player’s Exo Rig can be equipped with different pieces of armor for each body part including the limbs, torso, and head, with each of the limbs wearing armor independently for a total of six different armor pieces. The game features several armor sets, with each having its own stat bonuses to fit different playstyles. While the game allows players to mix and match pieces of armor from different armor sets, wearing a single armor set grants players with an armor set bonus. Players can also equip up to eight implants, which gives certain bonuses such as access to rechargeable health or regen consumables (which can be recharged at medbays or stations); longer health, stamina, and energy bars, increased damage, drone upgrades, the ability to see enemy health bars, and more. Implant slots can be unlocked by upgrading the Exo Rig’s Power Core, allowing players to use more implants. Players are also able to equip identical implants simultaneously to stack their effects, such as using multiple health boosting implants to maximize the health bar. Equipping armor pieces and implants consumes Core Power, which is based on the Exo Rig’s current Power Core level, limiting what players can equip. Players can raise their Power Core level using Tech Scraps collected from the world or from fallen enemies, allowing them to equip higher level armor and implants which have a higher Core Power Consumption. The player’s Power Core level also affects their ability to explore areas as control panels require a minimum Power Core level to activate, which unlocks access to facilities such as elevators, doors, additional control panels, and more. The Surge features several weapon types that give players the freedom to choose a weapon that fits their playstyle. These weapon types include one-handed weapons, two-handed heavy weapons, staves, and even dual wielded weapons, all of which feature some incredibly interesting designs. Each weapon type and weapon differs in their impact, which determines how easy they stagger or knock down an enemy, attack speed, proficiency scaling, and energy gain. Using a weapon builds a player’s proficiency with them, allowing players to focus on or specialize in a single weapon type. The game’s crafting system, which is one of its best and well-thought-out systems, allows players to craft and/or upgrade armor pieces and weapons using a combination of Tech Scrap and a single other crafting material depending on the armor or weapon being made or improved. Crafting schematics as well as the specific materials needed for crafting are mainly obtained from enemies by dismembering the body part of which the desired armor piece of upgrade is for. This connects to another one of the game’s systems that adds another layer to the game’s combat. 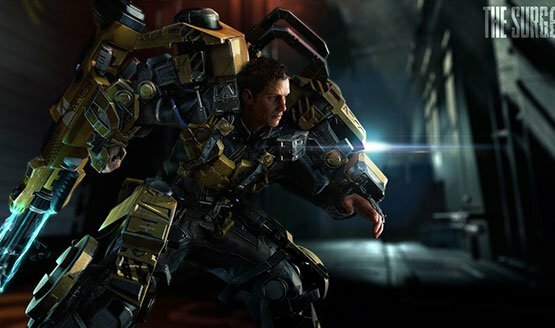 In The Surge, players have the ability to target and attack an enemy’s specific body parts. Players can choose to attack an unarmored body part to deal more damage or target an armored one with the goal to dismember it for new weapons, schematics, and crafting materials. This grants players the choice of either quickly taking down an enemy to reduce the changes of taking damage or take the risk and spend the time targeting the more durable armored parts to eventually dismember them and collect the rewards. Dismembering an enemy for their gear is achieved by performing a finishing move, a special attack activated when an opponent’s health as well as the player’s energy reaches certain points. Once available, players can hold the designated button to charge up the finishing move and, once the charge time is finished, initiate the short and incredibly bloody cinematic showing Warren slice off an opponent’s leg or arm in grisly fashion. Apart from initiating a finishing move, a player’s energy can also be used to activate certain implants including health restoration, stamina restoration, and certain buffs, as well as the player’s drone companion. The drone can be used to attack opponents from a distance or slow them down in exchange for energy. This, give players one more things to manage during combat, ultimately adding more to the game’s challenge and complexity. Apart from energy, players will also have to manage their stamina as many things the player does in and out of combat consumes stamina. From sprinting and dodging to attacking and blocking, stamina management becomes a crucial part of combat success in The Surge, making it not only challenging but also satisfying. Players will have to learn how to balance the usage of their attacks, dodges, and more with the limited amount of stamina they have in combat. Deck13 has also made combat different in The Surge by introducing vertical and horizontal attacks, replacing the more common light and heavy attacks. Both vertical and horizontal attacks can be chained independently and into each other and choosing one type of attack over the other is determined by the body part being targeted and figuring out the optimal direction to attack it in. Overall, the combat in The Surge is a massive improvement over the studio’s first attempt. Not only is it challenging and satisfying but it’s also very punishing yet rewarding. The combat animations for both the player and the enemies are fluid and transitioning between an attack to a dodge or block is pretty seamless. And while many opponents are quite easy to take down later on, it still takes some normal enemies only two to three hits to lead a player to their death, reminding players of the importance of dodging and blocking and just how punishing even small mistakes can be. Apart from the already challenging array of enemies players will have to face as they explore and traverse the game’s maps, there are also optional enemies that players can choose to fight. These optional enemies are almost always incredibly powerful and are able to defeat the player in one hit. The game’s few boss fights are also challenging in their own right, each with their own twists and mechanics for players to overcome. Some boss fights feature multiple phases that players need to watch out for and, just like normal fights, boss fights put an emphasis on the destruction of individual parts such as legs and arms. Dying in boss fights, or even regular ones, isn’t going to be a rarity in The Surge as learning the enemy’s attack patterns and timing becomes paramount. Dying in The Surge simply brings players back to the level’s Safe Room but without all the Tech Scrap they had with them at the point of death. Players can go back to where they died to retrieve the Tech Scrap they lost but it’ll only be available for a limited time. But the game does help players in spite of dying by adding a Tech Scrap bonus for every enemy the player defeats on their way back to retrieve their fallen Tech Scrap. Deck13 has built on the successes and mistakes of Lords of the Fallen and has created something that is able to not only stand toe-to-toe with the Souls franchise but is also capable of standing on its own with its unique identity. 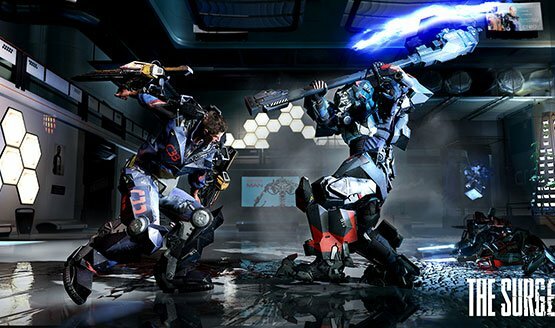 The new and different systems The Surge has introduced makes it an enjoyable and different experience for both newcomers to the genre and those who have already played Souls-like games previously. Deck13 has done a great job at combining the familiar and the new to create a unique vision that’s both fun and challenging.